Slevin Associates is the publisher of the following tax guides written with tax practitioners in mind. N.B. These guides assume a good level of technical knowledge of taxation generally. They are not written or normally suitable for ‘the man in the street’. This loose-leaf guide, which runs to over 129,500 words, analyses CGT entrepreneurs’ relief separately from the standpoint of sole traders, partnerships, shareholders in trading companies and trustees. See List of Contents Aug 2017. 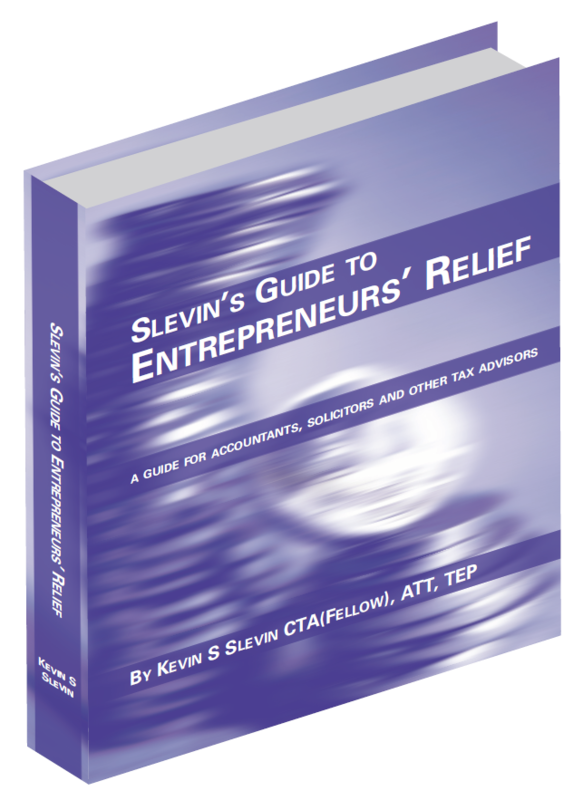 Updated eight times since its first released in 2008, Slevin’s Guide to Entrepreneurs’ Relief has proved very popular and is regarded as essential reading by the partners and staff of many accountancy and legal practices. The latest edition has been extended to include an outline summary of 'investors' relief' as introduced by Finance Act 2016. This summary runs to approximately 9,750 words. This publication is available at £185:00 plus £6.70 p&p. Professional firms wishing to purchase a copy need only send an order by email confirming the name of the addressee and the full postal address for dispatch. An invoice will be released with the publication. We ask for payment within 14 days of receipt thereof. First released in 2009, this guide has been re-launched in 2015 having been fully updated to reflect the law after the passing of Finance Act 2014. This publication is available at £155:00 plus £6.70 p&p. Professional firms wishing to purchase a copy need only send an order by email confirming the name of the addressee and the full postal address for dispatch. An invoice will be released with the publication. We ask for payment within 14 days of receipt thereof. New subscribers are currently be offered a complimentary copy of the 2017 updated pages due for release in October. N.B. The postage and packaging charge is waived for orders comprising two or more publications. Dispatch normally takes place within 7 days of an order being accepted. The Finance Act 2016 introduced a new measure designed to bring certain liquidation distributions within the charge to income tax (instead of capital gains tax). This Targeted Anti-avoidance Rule ('TAAR') which applies to distributions made on or after 6 April 2016 requires the taxpayer to consider whether four conditions are met and where if all four conditions are met, all (or part) of the distributions received from the liquidator of the company in question must be regarded as though it were a dividend received on the shares in question and therefore liable to income tax. Due to be released in June 2018, this guide will help explain the complexities of this new provision (no to be found in Section 396B ITTOIA) and will highlight the practical difficulties which arise. 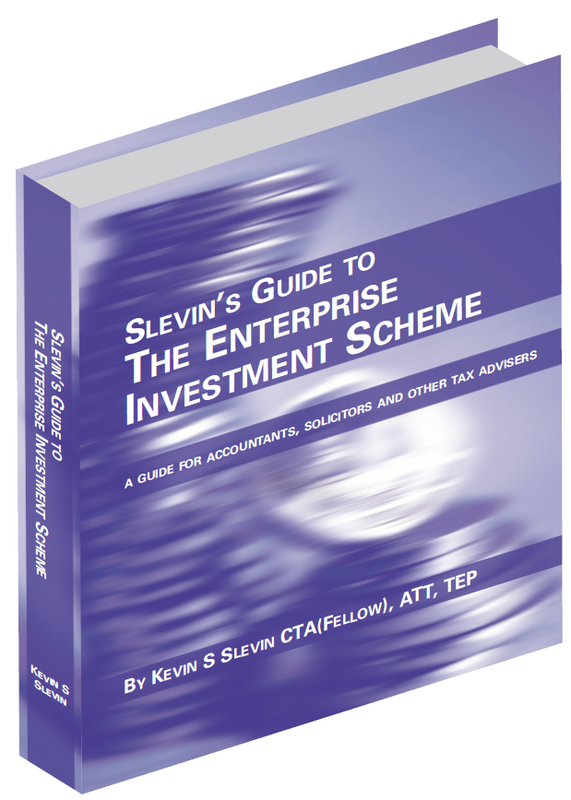 Due to be released in August 2018 Slevin’s Guide to The Seed Enterprise Investment Scheme is a loose-leaf publication for professional advisers with a good knowledge of income tax and capital gains tax. This publication is available at £125:00 plus £6.70 p&p. Professional firms wishing to purchase a copy need only send an order by email confirming the name of the addressee and the full postal address for dispatch. An invoice will be released with the publication when it is available and will be due for payment within 14 days of receipt thereof. Purchasers of this publication and already possessing Slevin’s Guide to The Enterprise Investment Scheme (or purchasers ordering both together) can claim a reduction of £40:00 in the SEIS publication. Due to be released in November 2018, this guide is written for lawyers and accountants advising clients on marriage breakdown. Written with a particular emphasis on clients with business interests, this guide will be unique in not only the exploring the general UK tax issues arising on divorce but also addressing matters such as the effective use of the ‘company purchase of own shares’ and the ‘company share reorganisation’ capital gains tax provisions. This publication will be available at £155:00 plus £6:70 p&p. Professional firms wishing to purchase a copy need only send an order by email confirming the name of the addressee and the full postal address for dispatch. An invoice will be released with the publication which will be due for payment within 14 days of receipt thereof.